“Innovation is at the heart of our industrialization strategy in achieving an entrepreneurship-driven economy,” said Department of Trade and Industry (DTI) Secretary Ramon Lopez at the Inclusive Innovation Congress 2017 on 31 May. According to the trade chief, entrepreneurship enables Filipinos to develop innovation mindset that will lead them to be value creators. He underlined the importance of value creation in products and services as it empowers micro, small and medium enterprises (MSMEs) to be more differentiated, competitive, and more progressive. “It will be our way to address the wide income gap and alleviate poverty,” he added. In his address, Sec. Lopez highlighted the role of inclusive innovation in fostering an ecosystem of entrepreneurship in the country. “The creation of new business ventures and the push for innovation in existing MSMEs are critical parts of an inclusive innovation process,” he said, highlighting DTI’s thrust towards MSME development and the sector’s integration to the global value chains. He also stressed the importance of inclusivity in sustaining the growth trajectory of the Philippine economy, with current government projects implemented to improve the quality of life of Filipinos, reaching those at the bottom of the pyramid. Said projects are aligned with the efforts of the administration of President Rodrigo Duterte to give particular attention to the marginalized sectors. Sec. Lopez highlighted the role of the government in ensuring an enabling environment for businesses to thrive efficiently. He cited some of the projects under DTI including Slingshot Philippines, research and development incentives for the manufacturing sector, QBO Innovation Hub, and DTI & Ideaspace Foundation, all of which were created to educate and inspire entrepreneurs to welcome creative ways of doing business. 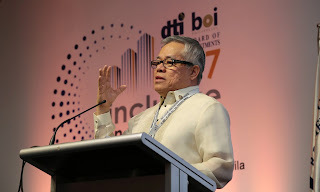 According to him, DTI also forwards strategies to endorse inclusive global value chains, reduce cost of doing business, and supporttechnopreneurs and innovators, who play critical roles in sustaining the economy’s growth momentum through innovation. “We would like to underline the need for proper coordination and collaboration between and among government, industry, academe and other stakeholders to build this inclusive innovation and entrepreneurship ecosystem,” said Sec. Lopez. DTI and the Department of Science and Technology (DOST) will sign on 1 June a Memorandum of Understanding (MOU) to strengthen collaboration on initiatives that promote inclusive innovation and entrepreneurship. Likewise, DTI will also tap other agencies such as the Commission on Higher Education (CHED), the Department of Information and Communications and Technology (DICT) and concerned stakeholders in formulating an Inclusive Innovation Roadmap. “Doing this would support our goal of creating globally competitive and innovative industries, attract investments, create more and better jobs, and generate shared prosperity for all,”’ he concluded.